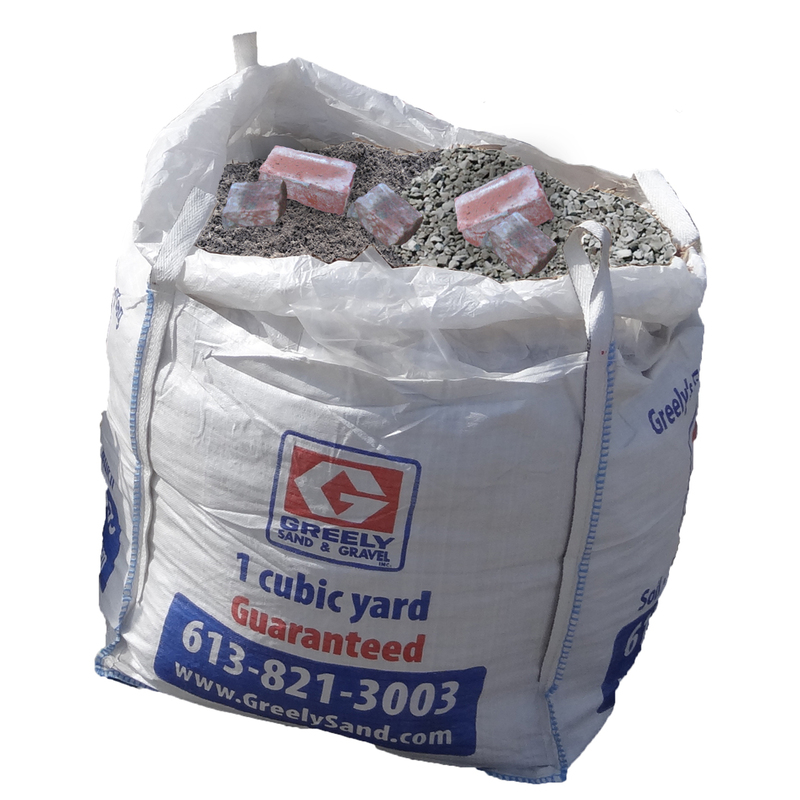 DisposaBag | 1 Cubic Yard Bag | Waste Pickup | Greely Sand & Gravel Inc.
Let Greely Sand & Gravel Inc. help you complete the final stage of your garden or do-it-yourself project by booking a Greely’s DisposaBag waste pickup online today. 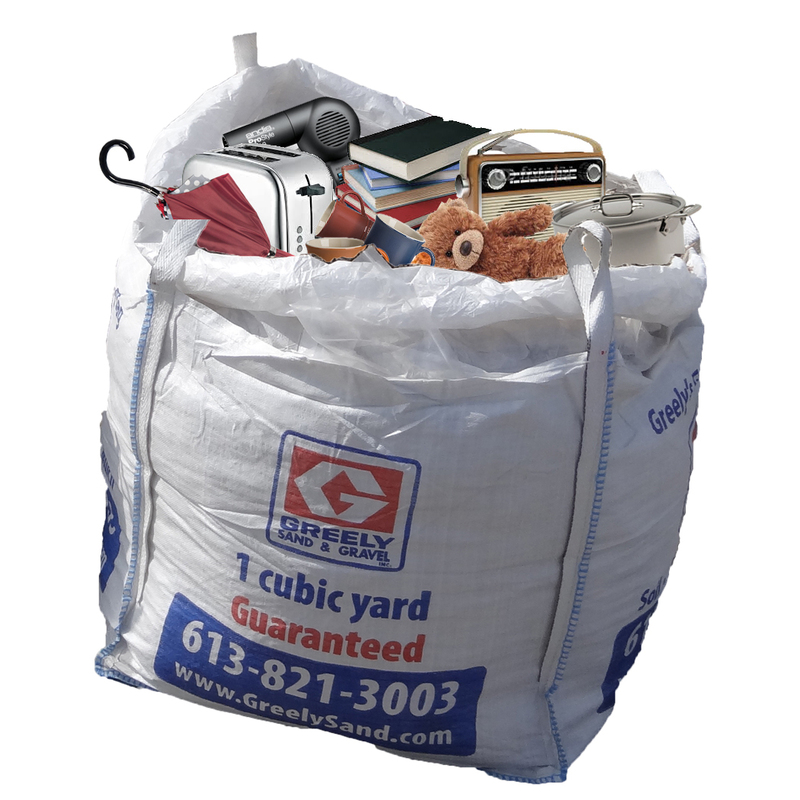 When you’ve filled your empty cubic yard bag with garden waste, excavation waste or non-hazardous household waste, our trucks will come pick it up from your home or work site—all you have to do is let us know when you’ve filled the bag! 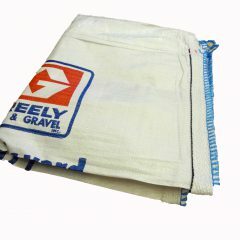 You can either reuse a Greely’s Gardening Bag you received from a product order but remember to check the integrity of the bag to ensure there are no tears, rips, or holes. 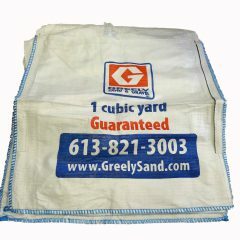 Otherwise, you can purchase empty Greely’s DisposaBags online and have them delivered. 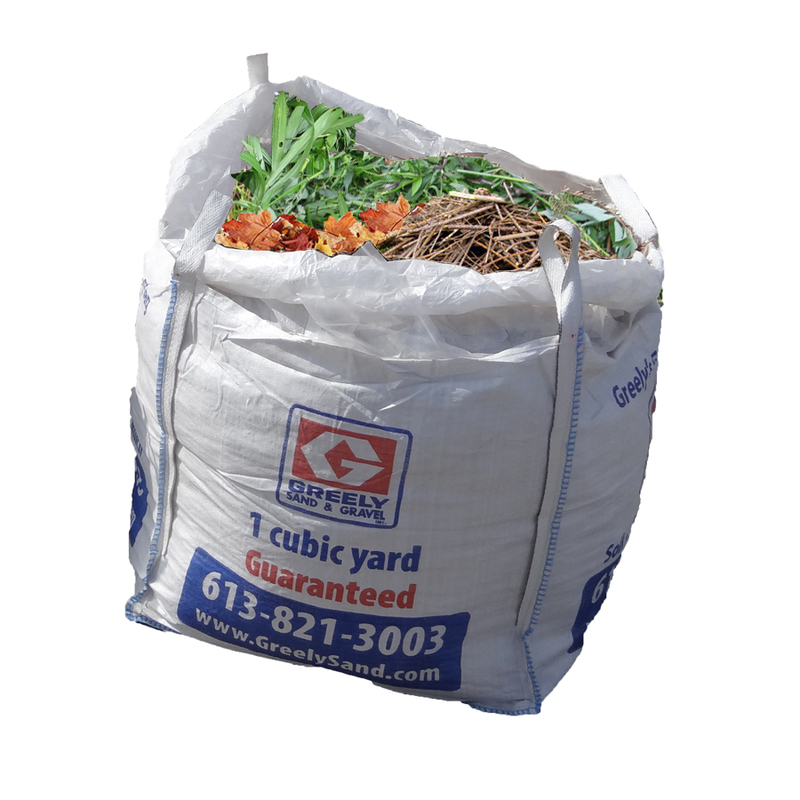 You can also pick up an empty DisposaBag at one of our landscape depots at a cost of $20 each. This empty bag fee does not cover the cost of the pick up of the filled bag. 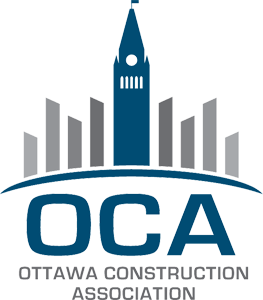 We pick up waste removal bags from most locations in the Ottawa area (from Central Kanata to Central Orleans to Kemptville). An extra charge may apply outside of this pick-up zone. Save $25 off the price of each additional DisposaBag of waste that is picked up at the same time. Pricing is based on full cubic yard DisposaBags. We do accept half cubic yard bags; however, pricing is the same as a full cubic yard bag. Excavation Waste – Almost anything that you can dig out of your lawn, including non-contaminated gravel, rocks, sand, soil and interlocking bricks. Non-Hazardous Household Waste* – Any material that doesn’t qualify as Garden or Excavation waste and can fit in your Greely’s DisposaBag, including small appliances, pieces of wood, scrap metal, construction material, plastic material, clothing and small pieces of furniture. * Paint, chemicals, solvents, fluorescent tubes, light fixtures with ballasts, batteries, drywall, contaminated waste and other hazardous material. 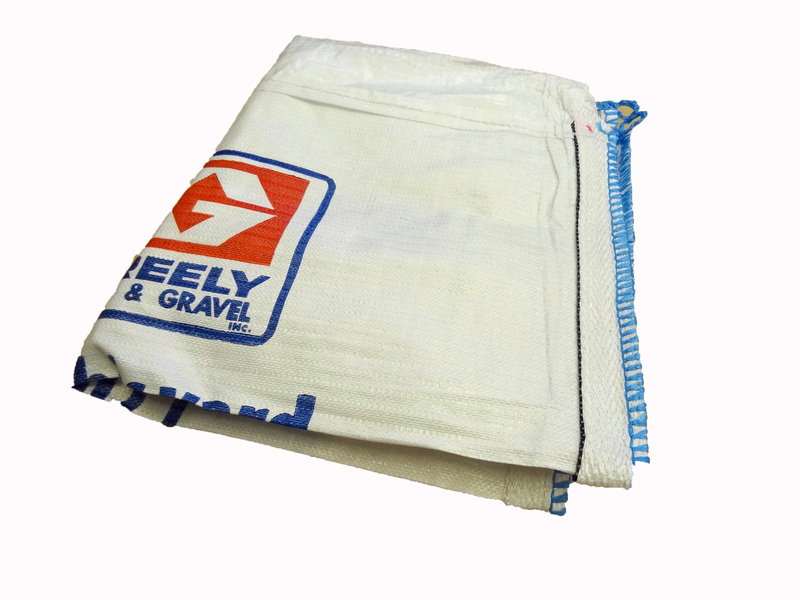 Greely’s DisposaBags hold up to 1,500 kg of waste, so make sure you put your bag in an easily accessible place before filling it. 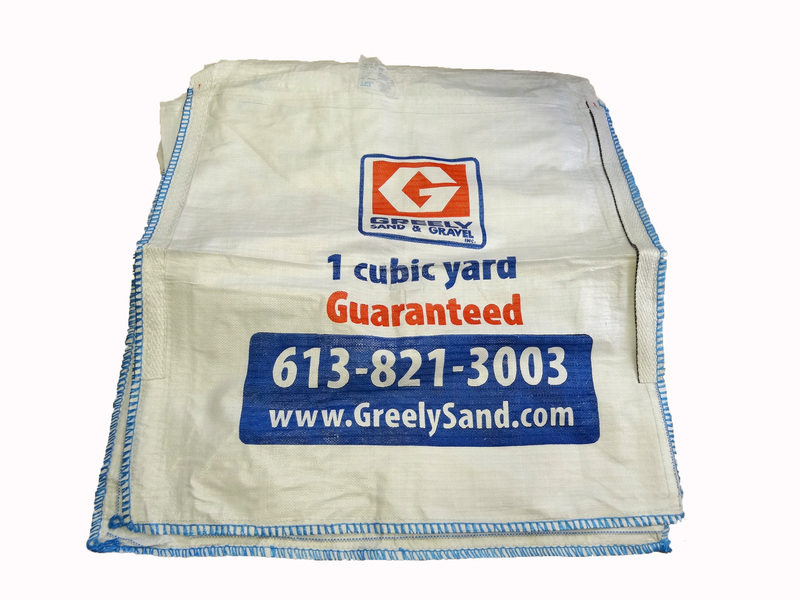 In order for our trucks to pick up the full cubic yard DisposaBag, the bag must be within 15 feet of the road and have the 4 corner loops accessible. 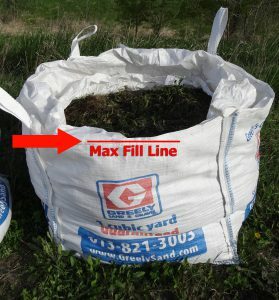 Keep in mind that there is a maximum amount you can fill the bags. When you’ve filled the bag to the max fill line, make sure you can close the top flap of the bag. Please note: Only one type of waste is permitted in the bag. Please note that if the bag is filled beyond the fill line or is not accessible by our truck, we will not be able to pick up the bag. 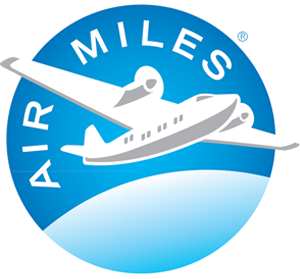 An extra fee will apply if we need to return at a different time to pick up the bag.